When we received this story from one of our Schnauzer visitors, it brought a tear to our eyes. We felt we must share with you this Mini Schnauzer story which has a happy ending. Hopefully it will serve as a reminder to anyone thinking of getting a Schnauzer puppy to make sure you select your pup from a reputable Schnauzer breeder. The breeding stock and pups should be kept in good conditions and preferably as part of the family. 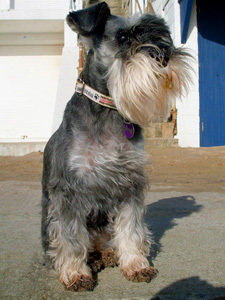 The story was sent to Max by Zara the Miniature Schnauzer, as told to her owner Emma, who lives in Swanage, Dorset, in the South of England. I just wanted to tell you about me and my adventures. 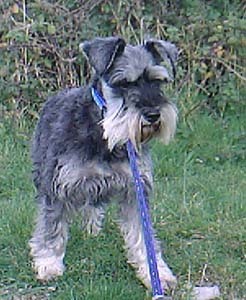 I’m a Mini Schnauzer and was born as Sara's Girl to a family of breeders who made me have lots of litters of pups. I lived in a piggery and had other Mini Schnauzers for company as well as Kelpies, Pekes, Poodles etc. On October 24th, 2007 a family from Dorset came to get me. It was the week of my 7th birthday. I was tired and still full of milk, plus my teeth were falling out. I found it hard at first as I never even had a collar on, but I really loved the beach where my new family took me for walks and I especially liked sleeping in their bed! I did hate it when my new family went out, though, and I really missed my pups. So what a surprise last Spring to find a new pup arriving in our household. Kasha is my lovely girl and now a naughty teenager. I feel very lucky to be warm and have lots of food - but I could do without be groomed every six weeks! I hear my daughter Poppy is looking for a new home and may come to stay. How differently things turn out!" If you have any Schnauzer stories, we would love to hear them. Just click on the Contact Max button in the left column. Mini Schnauzer Zara was one of the few lucky ones to escape from a treadmill of continuous breeding. She now has a new home with a loving family. Other dogs are not so fortunate. 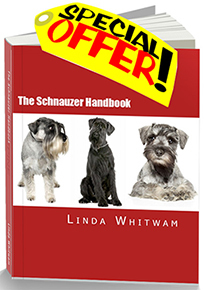 To find out more about what to look for in a responsible Schnauzer breeder follow this link.